Robert Sandvick was born on October 30, 1931, in Glasgow, Montana. After graduating from Montana State College in Bozeman, Montana, with a bachelor's degree in Agriculture, he enlisted in the Aviation Cadet Program of the U.S. Air Force on September 17, 1953, and was commissioned a 2d Lt in the U.S. Air Force and awarded his pilot wings at Bryan AFB, Texas, on December 18, 1954. Lt Sandvick next attended F-86 Sabre Combat Crew Training from January to June 1956, followed by service as an F-86 pilot with the 386th Fighter Bomber Squadron at Clovis AFB, New Mexico, from June to September 1956. He attended F-100 Super Sabre conversion training from September to November 1956, and then served as an F-100 pilot with the 387th Fighter Bomber Squadron at Clovis (renamed Cannon AFB in June 1957) from November 1956 to October 1957. His next assignment was as an F-100 pilot with the 477th Tactical Fighter Squadron at Cannon AFB from October 1957 to February 1959, followed by service as an F-100 pilot with the 481st Tactical Fighter Squadron at Cannon from February 1959 to February 1961. Capt Sandvick served as an F-100 and then F-105 Thunderchief pilot with the 67th Tactical Fighter Squadron at Kadena AB, Okinawa, from February 1961 to July 1964, and then as an F-105 pilot and instructor pilot with the 561st Tactical Fighter Squadron at McConnell AFB, Kansas, from July 1964 until he deployed to Southeast Asia in July 1966. He served as an F-105F pilot with the 454th Tactical Fighter Squadron at Takhli Royal Thai AFB, Thailand, from July 1966 until he was forced to eject over North Vietnam and was taken as a Prisoner of War on August 7, 1966. After spending 2,402 days in captivity, Lt Col Sandvick was released during Operation Homecoming on March 4, 1973. He was briefly hospitalized to recover from his injuries at Sheppard AFB, Texas, and then attended Air War College at Maxwell AFB, Alabama, from August 1973 to August 1974. Col Sandvick's final assignment was as Deputy Commander for Resources with the 64th Flying Training Wing at Reese AFB, Texas, from August 1974 until his retirement from the Air Force on July 1, 1977. 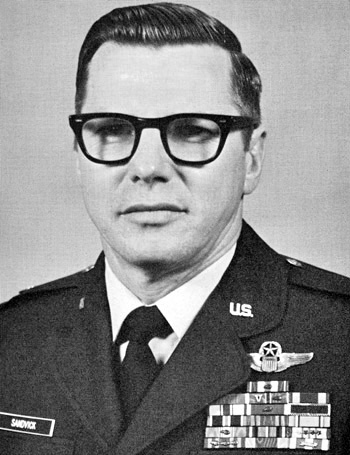 Captain Robert J. Sandvick distinguished himself by gallantry in connection with military operations against an opposing armed force near Kep Airfield, North Vietnam on 7 August 1966. On that date, Captain Sandvick was the pilot in the lead F-105 of a two-ship hunter-killer team assigned to patrol the heavily defended Kep Airfield in search of hostile surface-to-air missile sites. Despite encountering adverse weather and heavy hostile defenses, Captain Sandvick courageously pressed the attack with complete disregard for his personal safety. 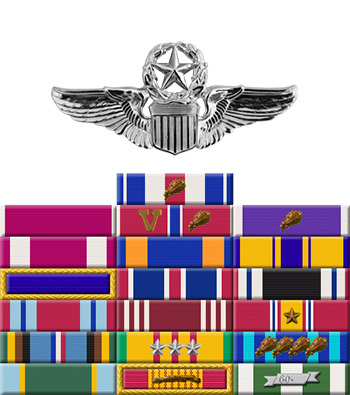 By his gallantry and devotion to duty, Captain Sandvick has reflected great credit upon himself and the United States Air Force.